Tigers aren't necessarily nocturnal, but they do prowl, hunt, eat and check out their sometimes vast territories at night. Among the planet's largest carnivorous land mammals, tigers once lived throughout Asia but now exist only in remote or protected areas. Evidence suggest these endangered predators have shifted more of their activities to nighttime to avoid encounters with people. Tigers typically hunt at night, resting and grooming between 8 a.m. and 4 p.m. Although they can be active in the daytime, they appear to favor nocturnal activity, especially in areas where they might encounter people. A 2012 study in Nepal's Chitwan National Park found that tigers hunted and traveled almost exclusively at night, apparently in order to avoid people during daylight. 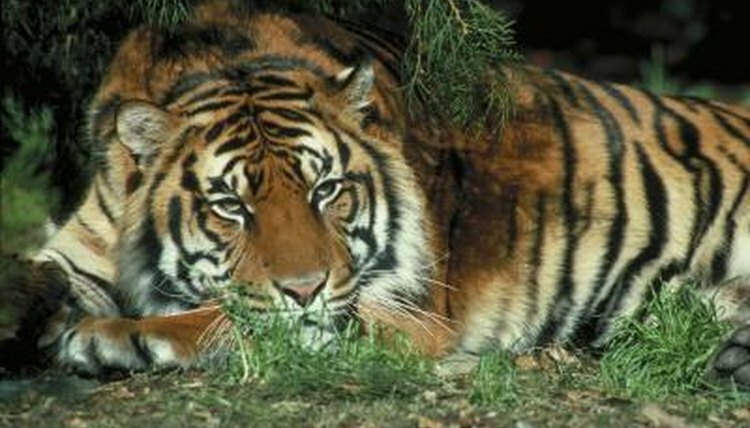 Another reason tigers hunt at night is because they prey mostly on nocturnal animals. Large ungulates -- hoofed mammals, such as wild boar, deer, elk, water buffalo and wild cattle -- make up a major portion of their diet. Depending where they live, they also might kill and eat leopards, pythons, crocodiles, Asiatic bears, brown bears and sloth bears. Sometimes they prey on domestic livestock, raiding villages and farms for cattle, goats, horses and pigs. By hunting at night, they increase their chances of avoiding people when they're near human habitation. Tigers usually stalk and ambush their prey. At night, their stripes help them hide in dense underbrush, trees and grass as they creep toward their intended meal. When they’re close enough -- 30 to 35 feet away -- they break from cover, race toward the prey and attack. To kill large animals, tigers bite the throat; to kill animals smaller than half their size, they clamp down on the back of the neck. They succeed in capturing prey only once every 10 to 20 hunts, so they spend a lot of time pursuing food. After killing a prey animal, tigers usually haul the carcass to a sheltered area, where they dine and then stash the remains for later meals. Depending on the size and population of prey, a tiger can eat up to 88 pounds of meat in one night. Often, a tiger revisits a carcass multiple times until it has consumed everything it can. On average, a tiger needs to kill prey weekly. Another nighttime activity for tigers is patrolling their territory. A female's territory can be 75 to 385 square miles; a male's is up to 15 times bigger. Territories can overlap a bit. Tigers are solitary yet social: Except for multiple mother cats with their young, they tend to be loners as adults; but they communicate with their neighbors via scent and scratch marks and occasionally congregate. They can travel 6 to 12 miles in one night as they check out the boundaries of their home ranges. What Is a Tiger's Natural Habitat?